A section of the rough draft of the US Declaration of Independence. 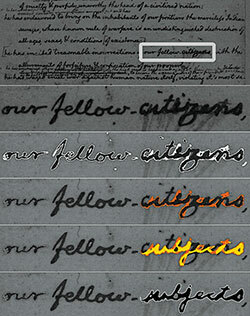 Hyperspectral imaging revealed Thomas Jefferson's original use of the word "subjects" before replacing it with the word "citizens." Image: Library of Congress. For collections with diverse types of materials including paintings, drawings, sculpture, decorative arts, and—of particular importance for libraries and archives—manuscripts, maps, and other historical documents, imaging not only presents a means of studying the objects but also, through digitization, allows greater access and preservation. Along with many other conservation tools, imaging has expanded in scope over the past fifteen years or so, both through advances in technologies used to capture images and with the accompanying development of new and different data types. Traditional photography enabled accurate documentation of an object before and after treatment, and for many years images were considered primarily that—a form of documentation. As the ability to scan and map spectral components developed, it became apparent that imaging could provide a much more complex picture, with layers of information from both the visible and nonvisible regions of the spectrum, greatly enhancing our knowledge of an object’s materials. The progression from an accurate photographic rendition to topographical renditions, spectral maps, and pseudocolor overlays has facilitated a variety of advances in the analysis, interpretation, and treatment of cultural heritage objects. Pseudocolor, or false color imaging (used for many years in medical and satellite imaging), allows a quick visual assessment of the different components within an object. In addition, its ability to reveal aspects of the condition of a heritage material (such as areas of damage, fading, or repair) is critical for effective conservation, documenting an object’s status before and after treatment, as well as tracking changes over time. Newer methods of imaging, which operate in nearly every region of the electromagnetic spectrum, continue to expand the scope of that information by providing data about chemical and physical properties of materials. For instance, hyperspectral imaging captures data in distinct narrow waveband regions of the visible and nonvisible spectrum. Utilizing reference databases, spectral imaging can identify a range of pigments and colorants, and linking this data with other imaging modalities, in particular X-ray fluorescence spectroscopy, enables complete noncontact characterization. Entire objects can be mapped across multiple regions of the electromagnetic spectrum, providing an overview of where materials overlap and where pigments that to the eye appear the same may, in fact, be different—vital information for guiding conservation treatment. Because images are now digital, processing can also enhance or suppress selected aspects of an object to reveal otherwise obscured condition information. At present, the level of information about an object that can be extracted is often restricted only by the ability of the preservation professional to interpret the many layers of data. But as computing capabilities develop to handle the ever-increasing flood of digital information, the ability to extract new insights will correspondingly increase. Significant effort is required to process and analyze the collected digital data, but the effort can lead to a wealth of information. Along with documenting the current condition of objects, imaging can also help visualize the unknown past of collections, such as revealing obscured or hidden text. Two important historical documents—the Dead Sea Scrolls and the Archimedes Palimpsest—have famously benefited from imaging efforts that made the text of these documents more accessible to scholars. Another interesting example is in Thomas Jefferson’s rough draft of the Declaration of Independence. Jefferson changed the word “subjects” to “citizens,” obliterating his original word choice. This word choice was clearly critical to Jefferson, who noted this word was “expunged, never to be seen again.”1 However, using hyperspectral imaging, Library of Congress staff could “see” this change, providing scholars with new insight into the creation of this important document. This ability to expose previously hidden information—along with the capacity to characterize materials and production processes through noncontact and noninvasive imaging methods—has encouraged imaging to be embraced not only by conservators and scientists, but also by scholars and curators. More imaging technologies focus on two dimensions than on three dimensions, yet every object has three dimensions. Many people do not think of documents and textiles as 3-D objects, but they are exactly that. The three dimensions of an object can be easily explored in microscopy and spectral imaging through confocal or z-plane imaging, with software programs that can create composite images. Laser scanning, photogrammetry, reflectance transformation imaging, and raking or side lighting are all aspects of imaging that are integrated with current spectral modalities and, through algorithms, can expand the type of imaging data being captured. As with spectral imaging, utilizing techniques from medical, satellite, and geospatial imaging simply requires customizing the technique to address heritage questions and then modifying the scope. Capturing the 3-D component of materials offers a new way to view them that may increase our understanding of how they were used. Three-dimensional imaging can also reveal nonvisual aspects of cultural heritage materials, such as resurrecting sound recordings from discs or cylinders that have been broken or damaged. IRENE technology (Image, Reconstruct, Erase Noise, Etc.) uses a laser to create 3-D images of the grooves in the surface of shellac, lacquer, or wax discs and cylinders, which can then be transformed into WAV files to reproduce the sound. Analogous to using Photoshop to remove blemishes from a photograph, this audio file can be processed to remove unwanted noise, such as pops, skips, and distortions, to make the original recording more accessible. No longer are broken or damaged heritage materials considered less useful; the information they contain can be rendered “visible” through an imaging-based approach. 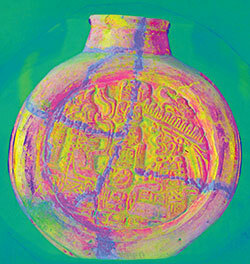 A ceramic Maya flask in the Jay I. Kislak Collection of the Library of Congress. The image shows previous mends that are not visible to the unaided eye. Image: Library of Congress. Imaging has also expanded our understanding of previous and new conservation treatments. For example, pseudocolor renderings, created through image processing, can visualize the spread of verdigris or copper corrosion on parchment and paper documents, providing conservators with a precise map of where the corrosion is occurring, even if it is not yet visible to the unaided eye. Along with providing maps showing the distribution of materials, the extraction of spectral curves can be used to monitor and evaluate discrete changes in colorants and the substrate. If collected at various times during a treatment, for example, spectral curves can be used to demonstrate that no unwanted changes have occurred because of the treatment. Even without a spectral component, imaging allows conservation treatments to be monitored. For example, confocal microscopy, which allows different depths within a textile fiber to be imaged, was used to assess the potential efficacy of treatments for the “Star-Spangled Banner,” the flag that inspired the US national anthem. This capacity to noninvasively monitor changes before and after an intervention greatly assists in creating a new level of confidence regarding the treatment of heritage materials. Passive, as well as active, conservation efforts also can be informed by imaging. Of particular interest is the ability of imaging to capture data about exhibition conditions, collection storage environments, and conservation treatments. The ongoing tracking of change in objects through imaging, in relation to their exposure to light, humidity, temperature, or pollutants, can show the effect of these parameters before significant damage has occurred, allowing the specific levels of sensitivity of materials to different environments to be determined. This capacity—which enables a better understanding of the impact of the exhibition environment and more control of display conditions—allows for more proactive integration of preservation into exhibition planning and design. Proactive monitoring to detect change before it is visible is a logical expansion of how we monitor built heritage and the external environment, moving from satellite imaging to object imaging. Libraries and archive collections often make their holdings available to scholars for study. However, even under controlled conditions, regular handling of objects carries the risk of damage. Imaging further assists in the preservation of such collections by making them more easily accessible while also providing new data for scholars and researchers—data that would not be captured from visual assessments and handling the object. Thus, the need for researchers to handle the materials is reduced, diminishing the necessity for subsequent conservation measures. 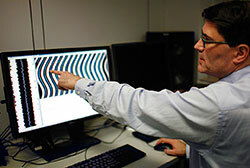 Peter Alyea, a digital sound preservation specialist at the Library of Congress, displays a digital image of the grooves of an old recording captured by IRENE. Photo: Abby Brack Lewis, Library of Congress. One challenge associated with the developments in imaging is the volume of data these advances generate, prompting the need for increased processing capabilities. Many imaging modalities generate a data cube (stacks of 2-D images collected at different points along a third dimension, typically wavelength), and this allows images to be combined in multiple ways. However, with the massive volume of data generated, sufficient time often is not allocated to fully examine all the data. Chemometrics—using mathematics and statistics to observe trends within data—is a tool we need to utilize more effectively to extract data and link imaging with other techniques. Also, too often there is a rush to use large complex systems, when the question should really be how much data is enough to answer the question being asked. One component of the successful use of integrated imaging systems is engagement with conservation and curatorial colleagues. The processing of data should occur in coordination with them. In our efforts to better preserve our heritage materials, we will continue expanding our ability to extract chemical and physical information noninvasively. The development of new techniques with the capacity to noninvasively image through and within materials offers much promise. For example, magnetic tape is a storage medium containing historic sound recordings, but when damaged it sticks to itself; imaging that could separate the magnetic sound particles from the background without unrolling the tape would assist in the reconstruction of those recordings. With the virtual unwrapping of carbonized papyri through imaging now possible, we can begin to “read” materials once considered lost to us. Fluorescence-lifetime imaging microscopy, a technique that produces an image based on the differences in the exponential decay rate of the fluorescence from a sample, is gaining use in heritage science to identify and map pigments and binders. Utilization of 4-D imaging from ultrasound modalities as a diagnostic tool for heritage materials will expand the use of tomography and reduce the need for invasive core sampling and cross-sectioning. The types of information that imaging can now provide have enabled scientists to communicate more effectively with diverse audiences. Heritage science is a truly multidisciplinary field, and often scientists and colleagues in different disciplines lack a fully shared language. Images that reveal layers of data in a quick graphic manner reach across disciplines and, of equal import, engage the public, scholars, managers, and administrators, conveying succinct and effective messages. Preservation science remains a mystery to many, so the ability to use visual representations to promote the importance of preserving cultural heritage is critical to its future. The development of imaging techniques advances our capabilities for seeing how objects have been constructed, created, and used over time, for improving conservation treatments, and for monitoring long-term environmental impacts, among many other benefits. Imaging throws open new portals to what we could not visualize or even imagine before, helping us better understand, appreciate, and preserve our cultural heritage. Fenella G. France is chief of the Preservation Research and Testing Division of the Library of Congress. 1. Thomas Jefferson, The Papers of Thomas Jefferson, vol. 1: 1760–76, edited by Julian P. Boyd (Princeton, NJ: The Princeton University Press, 1950).